Lahore Qalandars - the whipping boys of the PSL no more. Or so their fans would hope, and the manner of victory on Friday must have raised their hopes. At one stage, it looked like familiar sorry tale would play out. Qalandars looked set to concede in excess of 220. Drooped shoulders and worried faces within the team, nails chipping sharply off the owner's finger - it wasn't where they wanted to be. Then they found a magic wand through the fingers of an 18-year-old from Nepal. Sandeep Lamichhane, fast becoming a global T20 citizen, struck three vital blows to stymie Multan Sultans as they finished on 200 for 6. Buoyed but by no means guaranteed victory, Qalandars started superbly courtesy a bruising Fakhar Zaman half-century before panicking. Sweetly-timed strokes replaced by mistimed hoicks, shrieks of desperation and eventually three wickets in the space of nine deliveries. The onus was on AB de Villiers, still quite the crowd favourite even if he is now nearly a year into international retirement. On a smallish Sharjah ground, he set himself in, saw the asking rate spiral to 14 with five overs left. 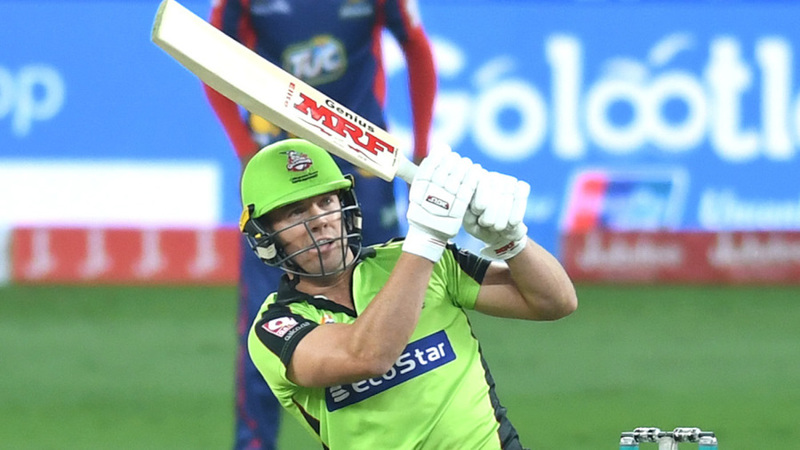 Then left with little option but to go for broke, he launched a sensational assault, bringing up his half-century off just 26 balls courtesy three fours and three sixes, including a sensational reverse scoop over third man after having set himself up originally for a ramp over fine leg. He was helped in no small part by fellow South African David Wiese, who muscled five sixes, including one off the final delivery with Qalandars needing three to win. The outpour of emotions in the aftermath, and the 'dancing in the isles' - made famous by Tony Greig's on-air commentary frenzy - by men wearing light-green t-shirts told you a story. This was one of Qalandar's most special PSL memory yet. This was the second-highest successful chase in PSL history, only behind Quetta Gladiators' chase of 201 against Qalandars in 2016. After a blistering half-century from Zaman, Junaid Khan tilted the game firmly in Sultans' favour with a three-wicket burst in just seven deliveries. Qalandars, flying high and happy, encountered turbulence. Was a crash landing on the cards? Brendan Taylor's experience may have been invaluable. His presence along with de Villiers after the clutch of wickets could've given Qalandars the stability before the final kick, but he hobbled off after facing just one delivery. A pulled calf-muscle could yet put his PSL campaign on the rocks as he had to be helped off by two of his team-mates and the physio. The biggest moment, however, was the drop in the 18th over of the chase. With Qalandars needing 33 off 14, Wiese top-edged a wild heave to be caught superbly by Malik running in from cover. Then, he saw the umpire signal no-ball, they ran a single and de Villiers tonked the free-hit for a six. The pressure was off, the game back in Qalandar's control. Multan's opening pair of James Vince and Umar Siddiq added 135 in just 11.5 overs. Vince accounted for 84 of those, 64 coming in boundaries. Such was the flurry of sixes that the fourth umpire, who would've loved to sit inside the cosy air-conditioned box, had to run in a number of times with a box of used balls. Siddiq played the perfect foil in the partnership, allowing the more-established Vince to play his way. It was the perfect combination of fire and ice, before Lamichhane, another ice-cool teenager, kept tossing the ball up in the hope of a wicket. Lamichhane was welcomed with a biff from Vince that sailed into the crowd at deep midwicket, pummeled over the same region four balls later. The over went for 18 - it wasn't the PSL welcome he was looking for, but hey, he wasn't done. In his second over, the 12th of the innings, he continued to be brave. Denied once after a miscue landing short of long-on, he had Vince holing out to long-on off a skiddy delivery that rushed through to come off the bottom of the bat. In his next over, Lamichhane was launched for two huge sixes but had the last laugh when Shoaib Malik, looking to sustain momentum, was caught at long-off looking for a third six in the over. His third strike, in the 16th over, was the biggest of the lot. Andre Russell, among the most-feared hitters in world cricket, had just been dropped three balls earlier, and carted Lamichanne out of the ground. But he deceived him in the air, and had him top-edge a slog for a smart return catch. This played a key role in Sultans finishing with a total much lower than they looked set to get at one stage. Qalandars lifted themselves off the bottom to be placed third after four games. Sultans are a spot below, with a solitary win in the same number of matches.